The function of coats of arms, great seals, and emblems is to identify a place, person, or institution. Since the 1600s a variety of official symbols have represented Newfoundland. Among the earliest were the coat of arms King Charles I granted Sir David Kirke in 1638 and the great seal authorized by King George IV in 1827. Other identifying emblems come from the natural world and include animals, minerals, and plants. 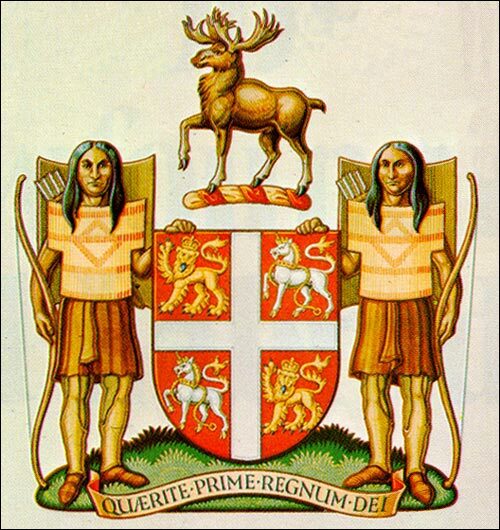 The coat of arms is one of the oldest in Canada, second only to that of Nova Scotia. Yet it is also one of the most recent to have been adopted for official use. In November 1637, King Charles I granted the "whole Continent, Island or Region commonly called Newfoundland" to a business syndicate known as the Company of Adventurers to Newfoundland, headed by Sir David Kirke, who was governor from 1638 to 1651. About six weeks later, in January 1638, the king also granted Kirke a coat of arms, "For the greater honour and splendour of that Countrey and the people therein inhabiting … to be used in all such cases as Armes are wont to be by other nations and Countries." Soon after, a civil war broke out in England between king and parliament. The Kirkes (as royalists) were on the losing side, and the coat of arms was forgotten. Until it was rediscovered over two hundred years later, the colony used the royal coat of arms. Newfoundland and Labrador's coat of arms is one of the oldest in Canada, second only to Nova Scotia's. Yet it is also one of the most recent to have been adopted for official use. Courtesy of the College of Arms (Miscellaneous Grants 4.7), London, England. From Peter Neary and Patrick O'Flaherty, Part of the Main: An Illustrated History of Newfoundland and Labrador (St. John's, NL: Breakwater Books, ©1983) 31. Image modified by Wendy Churchill, 1999. In the early 1920s, the Imperial War Graves Commission asked what arms should be used on memorials in French cathedrals commemorating Newfoundland's involvement in the First World War. Newfoundland's High Commissioner in England, Sir Edgar Bowring, sought advice from the College of Arms in London. On 18 February 1925, the College confirmed that the Kirke coat of arms belonged to Newfoundland, and the government officially adopted it on 1 January 1928. It has remained in use ever since. The arms consist of a red shield divided in four parts by a silver cross, with lions and unicorns in the quarters. The cross is similar to one that appears on the arms of the Knights of St. John the Baptist, and probably refers to the old legend that John Cabot sighted Newfoundland on the saint's feast day (June 24) in 1497. The lions and unicorns resemble those on the royal coat of arms and represent Newfoundland and Labrador's ties to the United Kingdom. 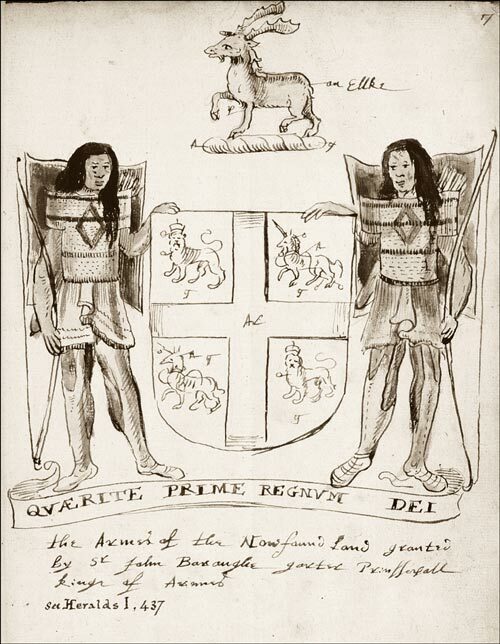 The two supporters standing on either side of the shield are fanciful 17th-century English interpretations of Newfoundland's Native peoples. An elk stands above the shield, no doubt representing the island's wildlife. Elk have never existed in Newfoundland. Written on a scroll at the bottom of the shield is the motto "Quaerite Prime Regnum Dei", which translates from the Latin as "Seek ye first the kingdom of God." Great seals identify and authenticate documents issued by governments and monarchs. They are applied to paper by wax or by embossing, both of which create a raised image of the seal on the document. After 1904, the Great Seal also appeared on Newfoundland's red and blue ensigns, and on the official flag of the governor. The Great Seal was given royal approval in 1827. Reproduced by permission of The Rooms Provincial Archives Division (GN2/5), St. John's, NL. The earliest documented Great Seal of Newfoundland received royal approval from King George IV on 1 September 1827. It depicts Mercury, the classical god of commerce and merchandise, presenting to Britannia a fisherman who, kneeling, offers her his catch. 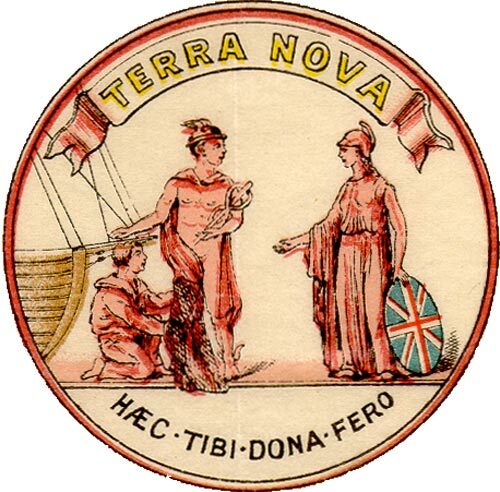 Below are the Latin words "Haec Tibi Dona Fero" ("These gifts I bring thee") and written around the circumference of the seal is "Sigillum Terrae Novae Insulae" - "Seal of the Island of Terra Nova". In 1837, when Queen Victoria took the throne, she approved a new seal for Newfoundland. Britannia, Mercury and the Newfoundland fisherman occupy the bottom two thirds and are contained within an elaborate frame. Above sit the royal arms, with a lion and unicorn on either side. Written around the top edge of the circular seal are the words "Victoria Dei Gratia Britanniae Reg F D" (Victoria, by the grace of God, Queen of the Britains, Defender of the Faith), and the bottom edge reads "Sigillum Terrae Novae Insulae" (Seal of the Island of Terra Nova). This basic design remained in place until well after Confederation. The only changes were the style of the frame and the scroll around the edge (usually to incorporate the name of the current monarch). On 3 July 1963, Newfoundland adopted a new Great Seal. The fisherman kneeling before Britannia, a colonial image, was replaced by the coat of arms, with "Newfoundland" written near the bottom curve on a scroll. Encircling the top are the words "Elizabeth II D.G. Canadae Regina" (Elizabeth by the grace of God, Queen of Canada). 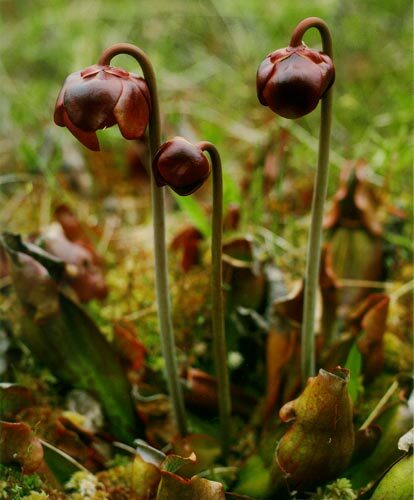 The official floral emblem of Newfoundland and Labrador is the pitcher plant (Sarracenia Purpurea). It first appeared as a Newfoundland symbol in 1865, when it appeared on the obverse of the Newfoundland one cent coin. The coins were last minted in 1947. The pitcher plant is the official flower of Newfoundland and Labrador. Reproduced by permission of Ben Hansen. From Ben Hansen, Newfoundland (St. John's, NL: Vinland Press, ©1987). The pitcher plant became the official provincial flower in 1954, and in 2006 the government adopted a new provincial logo incorporating a stylized version. The logo appears on government documents and web sites. Other emblems were adopted after 1949. The puffin (Fratercula Arctica) is the province's official bird; the partridge (Lagopus) its official game bird; black spruce (Picea Mariana) its official tree; and Labradorite its official mineral. For other related articles view the Society and Culture Table of Contents.